Displays up to 6 pairs of skis in style! This is the clearance version of our popular Cedar Ski Wall Rack. This clearance rack is 100% functional but shows signs of light use from our video studio. Clearance items are sold as-is, no warranty, no returns. A simple, stylish way to hang all your skis The Vertical Cedar Ski Wall Rack is a rock-solid way to hang your skis as well as a sleek, rustic looking piece to use in your home. 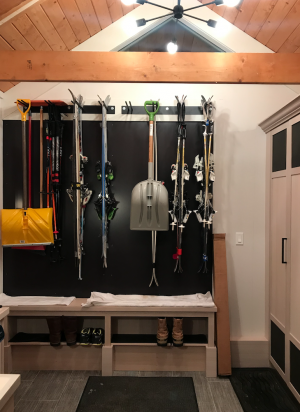 Mount this rack in your home, mudroom, garage, or ski cabin for the best all around solution to store your skis with a warm look. The vertical design keeps all your gear upright and neatly organized so you are ready to hit the slopes for your next run. Stop dinging up your skis by trying to lean them against the wall, get one of these racks up and make it look like it always belonged in your home! Hand-crafted Each ski rack is made locally by hand to ensure quality craftsmanship. Every cut and measurement is precise to fit your skis perfectly while reducing leftover waste of such a beautiful wood. You can feel good about your environmentally friendly purchase and focus more on showing off your awesome skis! Natural, non-treated cedar wood The rack is shaped from a single cut of raw Western Red Cedar for strength and durability. Not to mention, cedar is also naturally water resistant without the need for any harmful chemicals or sealants to treat the wood. It provides the prefect hold on your skis, even if your gear is still a little snow-covered or wet right off the slopes. It's almost like this wood was made to hang your skis! Horizontal or vertical storage The Cedar Ski Wall Rack is deigned to hang your skis vertically along the wall with one rack installed horizontally. Double up with 2 racks and you can then mount each rack vertically to hold each end of your skis for storage horizontally. Great for other gear The rack is designed to perfectly fit your skis but it also works great with snowboards, skateboards, and longboards! Make it even easier to store your skis Check out our Premium Ski Velcro Straps to ensure your skis stay tightly strapped together for easier handling. Wall rack: 44" x 3.5" x 3.5"
Can I install this mounting system into a concrete wall? Yes, you could potentially mount this ski rack to a concrete wall. It ships with hardware to mount it into standard wood wall studs, so you would need to obtain additional concrete/masonry anchors, such as TapCons, to mount it to concrete. Those can be found anywhere you buy hardware, online or in person. Then, if you have never mounted any type of rack or other item to concrete before, you would probably want to talk to someone you know that has, or do some research for tutorials online to get an idea of what is involved. Other than those notes, it can work!